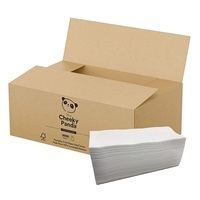 The Cheeky Panda Bamboo Paper Hand Towels are made from 100% natural sustainable bamboo. Bamboo grows 20/30 times faster than trees and produces 30% more oxygen, it is skin friendly, and an excellent alternative fibre for producing tissue products. Organic, hypo allergenic, FSC certified, and free from B.P.A, formaldehyde, chlorine, fragrance and de-inking agents, The Cheeky Panda Hand Towels are both sustainable and perfect for sensitive skin.